The organ come apart easily enough by removing the woods screws on the bottom side. The first thing I usually do with these old organs is replace the filter caps in the power supply. This will usually elimate a lot of the noise in the background of the output, and ensure the longevity of the power supply. Remember to Use replacement caps of AT LEAST the same or higher voltage rating. The Capacitance (Farads) doesn't have to match up exactly, but when it comes to the filter caps, its usually better to err on the higher side. 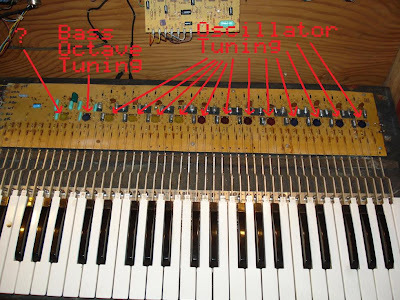 Next to the keys: The main and largest board contains the tone generation and key contacts, and the smaller board contains the tone filtering for the different voices (reed, flute, etc). 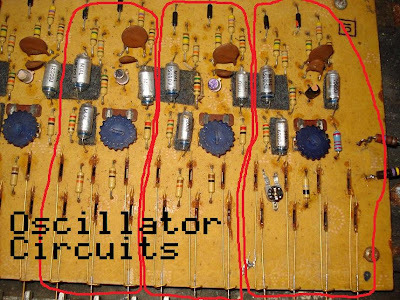 The way these oscillators work is a bit different then most organs of the day. Instead of having 12 top oscillators (1 for each note) and divide down circuitry for lower octaves, this organ groups its notes in threes. For example, C, B, and Bb will all use the same oscillator . This means only one of those 3 notes can be played at once. The circuitry gives priority to the highest note being played. There are 2 exceptions to this. the first is the bass octave, in which all 12 notes are running from 1 oscillator, and the highest 4 notes, which share one oscillator. 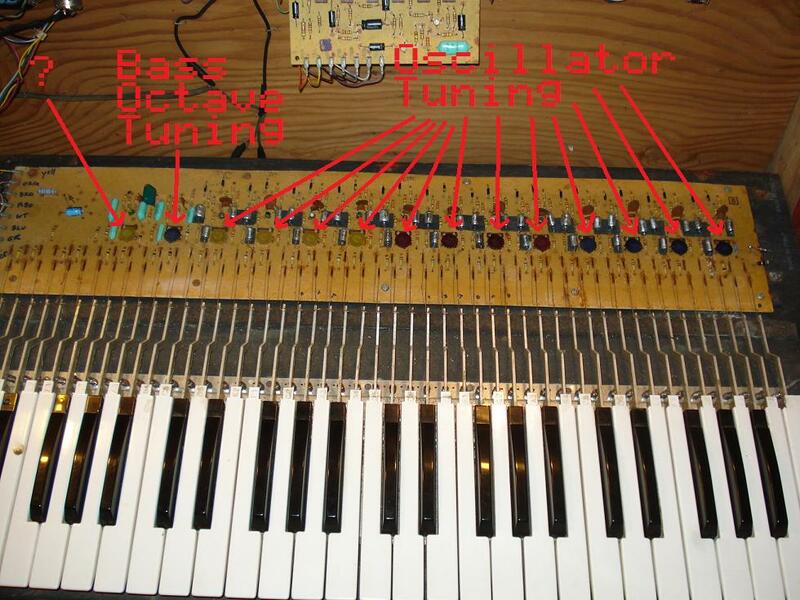 The three notes that were not working on this organ all shared an oscillator circuit. 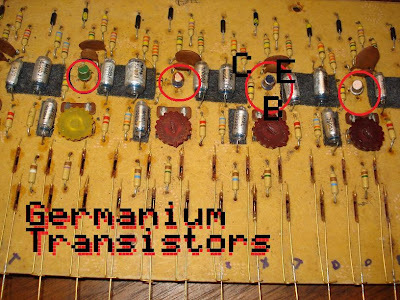 After switching out a few components with oscillators that were working, the problem was found to be the germanuim transistor. unfortunately, they were all unmarked, but I found a suitable replacement w/ and NPN silicon transistor I had on hand (C945). I am sure there is a better match, but this one worked fine in a pinch. 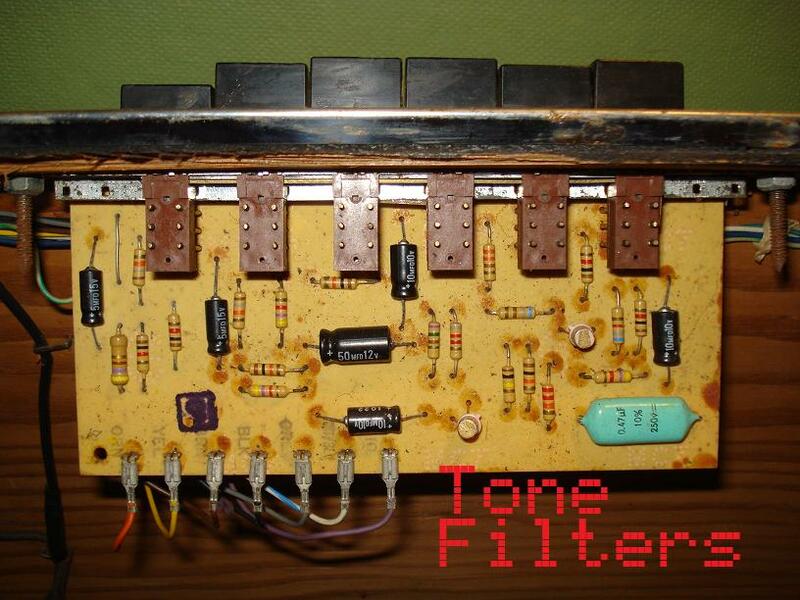 The notes in each oscillator group are tuned by the large trim pots on the tone generator board. The second to left one tunes the bass notes, and I couldn't figure out the far left one! The best way to approach tuning this machine is to tune the highest note in each oscillator group. 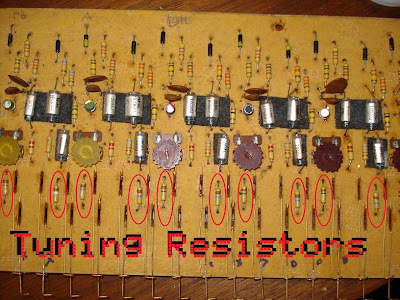 If this brings the other notes in that group out of tune, it is because the tuning resistors have gone out of tolerance, and they will need to be replaced. The simplest fix here is to just install a trim pot in place of the tuning resistor. I recommend a 2K pot, as most values I found to work were in the 500-1000 Ohm range. Remember to work from Right to left, because tuning the higher notes will affect the lower ones (in a specific oscillator). This is exactly what I was looking for. I'm restoring an old Whippany Dart which has a nearly identical board. 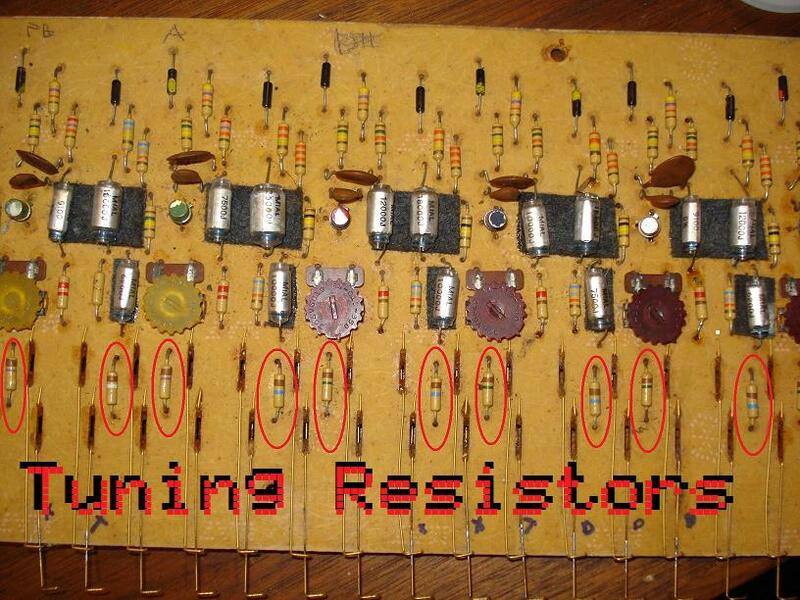 I'm going to try out replacing the resistors with their own pots as you suggested. Great idea. I'm also working on a Whippany Dart. I have one group of keys that even at minimum resistance on the trim pot will not quite tune true. I wonder if you have a suggestion for a fix? I'm hoping a resistor in parallel with the pot should do the trick. Hello, I recently purchased a Realistic Musicdeck. 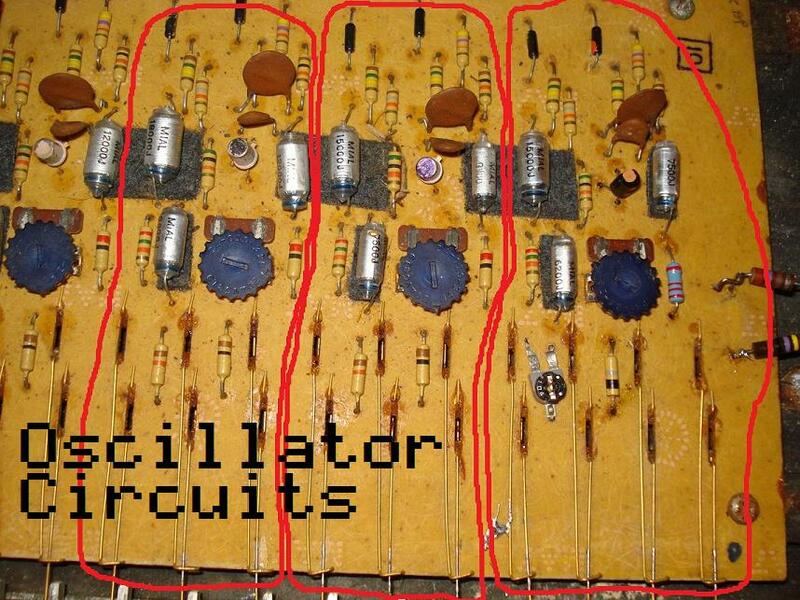 It has the exact same circuit boards in it. 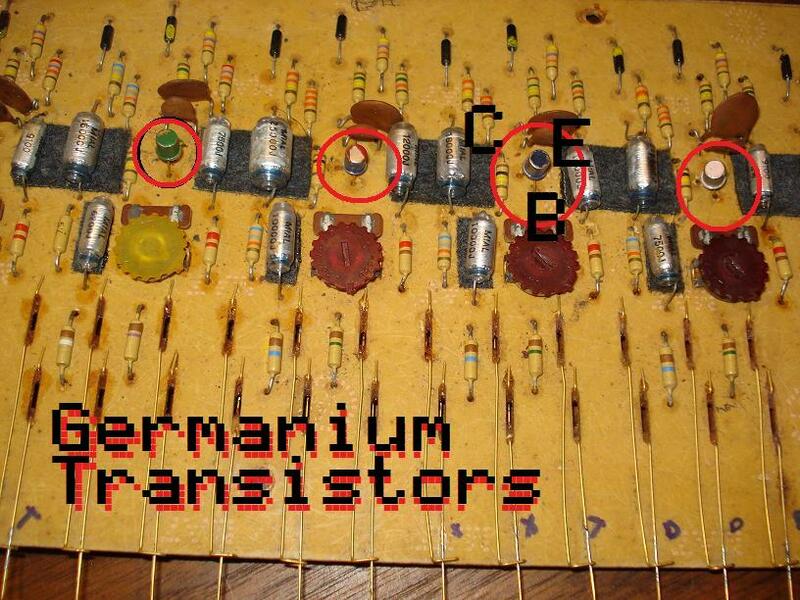 Aside from the transistors and resistors, I would like to replace the electrolytic capacitors. Can you recommend any suitable replacements or a cross reference? Thanks. I also acquired a musideck and yes, this guide has been helpful in getting it tuned. It still has such a quiet output and some notes louder than others. Wondering if you made any headway on yours, and if you found the parts you need, since I suspect replacing the capacitors will help the output strength on mine.